When I first came to Italy and saw Insalata Russa, I was a bit confused. Well, in Croatia we have both, Russian and French salad. I never asked why they were called that way. All I knew was the difference between the two: the Russian salad had boiled meat in it, French no. Recently I read some comments in a forum by Russian girls living in Italy. Basically, they explained that in Russia they have this salad (with meat) and it's called Olivier, named after a chef who owned a French restaurant there. So, finally I know I wasn't completely wrong. Of course, you can adjust the quantity of each ingredient according to your taste, or increase the overall quantity according to your needs. You can also add onions and celery if you like. It is an excellent side dish with roast meat, ham, or served at a party. You can prepare it a day ahead and keep in the fridge until serving. If you are boiling potatoes and carrots, you need to boil them separately without peeling them first, I prefer steaming them, so I peel them first and cook them together. Boil peas and eggs. Chop all ingredients into small cubes, place them in a bowl (a little bigger then the one you'd use for serving), salt and add just enough mayonnaise to combine all ingredients together. Cover and leave in the fridge for a couple hours or over night before serving. 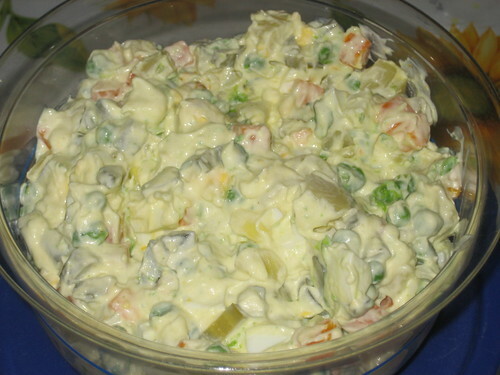 I prepared this salad for Easter lunch this year, and it kept well for three days. My advice is to use regular mayonnaise and not the yogurt or light one, as they tend to become liquid when mixed with vegetables. I've never heard of that salad before, but it sure looks good! But it looks just like German Potato/Noodle Salad....no kidding...they look exactly the same. 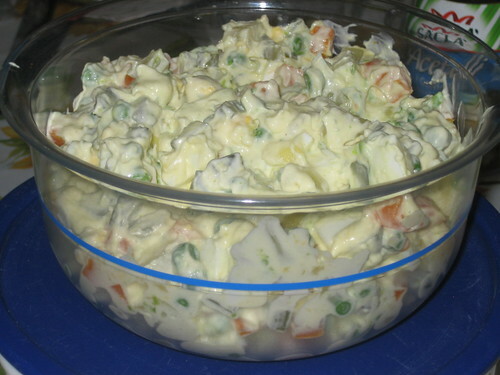 It's like our potato salad, only better!! And I love Real mayonnaise in my salads, this looks really delicious! With all these vegies mixed + the pickles, it absolutely isn't boring, I just love it. And, Danielle, since you love chicken, I suggest you add boiled chicken as well, that would be the Russian version. I wasn't very familiar with this salad's name history, but it looks delicious! I'm Russian and we always make on holidays.